HARWICH, Mass. 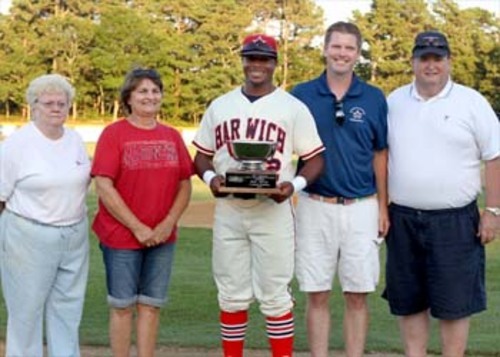 -- Each year, the Cape Cod Baseball League presents the Pat Sorenti Most Valuable Player Award to a talented, hard-working, productive individual whose efforts made a major impact on the league. Harwich’s Phil Ervin (Samford) has done just that. Right from the start, Ervin was a major force for his team, terrorizing opposing pitchers and outfielders with his home run count. By the third week of the season, he already hit more home runs than last year’s season-long leader, the Braves’ D.J. Hicks (Central Florida), who hit seven out of the park in 2011. His performances at the plate earned him the Coco Cola Player of the Week honor in Week 2, thanks to five early home runs and a .440 average. 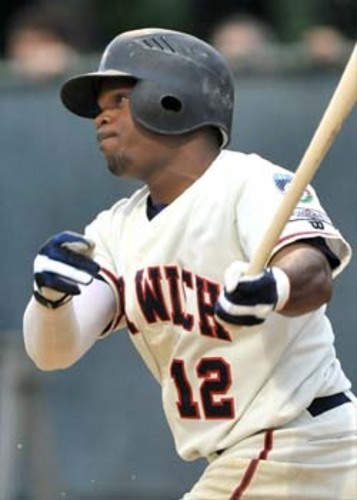 Despite relinquishing his role as home run leader after cooling off at the plate towards the All Star Game break, Ervin’s status as a power hitter was cemented and he finished the regular season tied for third with 11 home runs. Ervin finished as the top all-around hitter for the West Division Champions, batting .331, with 42 hits, 31 RBI, and 29 runs. He was 2-for-3 at the plate in the Cape League All Star Game, where the outfielder represented his Mariners on their home field. The 5’10 native of Leroy, Alabama started in 55 games for the Samford Bulldogs in 2011, and led the team with a .371 batting average. He also had a season-best 19-game hit streak and was named a Freshman All-American. Ervin joins a star-studded list of players who’ve earned the MVP award, including Evan Longoria (Chatham ’05), Carlos Pena (Wareham ’97), former Red Sox captain Jason Varitek (Hyannis ’93), and late New York Yankees captain, Thurman Munson (Chatham ’67).